Don't you want to be Alive before you die? There is only chance in this world, chance and physics. Travelers have a choice to walk the paths of logic or be inspired to follow their heart. Inevitably, the traveler who listens to the still, small voice inside has a greater chance of completing a heroic journey, than one checking of the lists in the travel guide. Every outcome has its cause, and every predicament has its solution. Every lock its key. When the student is ready, the teacher will appear. Travelling with my wife of 33 years in Guatemala in December 2015 we encountered a deeply knowledgable Tata, a mayan timekeeper who only shares what the student is ready to receive. Information was guided by questions, also the nature of seeing coincidences. In the end it was a deeply powerful journey that began with no itinerary. Many of our transformational journeys begin with a sense that “we have been called." My wife Martha teaches shamanism and lives of ceremony in programs at our nature retreat Northern Edge Algonquin we have come to know as “The Way of the Circle”. In the fall of 2015, a guest at our nature retreat introduced Martha to Juan Antonio, a distant connection on Facebook. Shortly thereafter, Juan Antonio invited us to visit him in Guatemala. Martha travels the world on spiritual journeys. Sometimes she travels with her friends, but on this journey I was her only travel companion. When Martha asked me if I was interested in joining her I knew I had to go on this trip. Often, when we travel we entrust the travel planning to one another and then just follow along. On this trip, as the plane was landing in Guatemala City I still had no idea what we were going to be doing in Guatemala. Neither of us spoke the language. So here we were in a foreign country, where we didn’t speak the language, not knowing the name of our hotel and only having exchanged text messages through Facebook with someone who was going to look after us. I sure hoped someone was there to meet us in the airport. Juan Antonia is a sweetheart. He spoke good English and took us to a nice hotel in the early morning hours where a wedding party was rocking the hotel lobby. He promised to pick us up at 7 am to drive to a remote town to meet the Tata. When we arrived at Tata Jose’s home, in a small village next to a National Archeological site at IXIMCHE, a one-time capital of Mayan Kaqchiqueles kingdom, we were welcomed with smudging and ceremony as we entered the yard. We exchanged gifts from Canada including sage, sweetgrass, honey, maple syrup. Tata Jose, was wondering if we could help him understand how to use a large drum that had been gifted to the community by George W. Bush during a state visit to IXIMCHE in 2007. The drum had been unused by the community because they didn’t know how to use it. “Well, the first thing we need to do is feast the drum,” suggested Martha. Over the next hour the drum was massaged with the gifts we had brought as well as flowers, strawberries and oils provided by our hosts. Finally, the Tata’s family played the drum. As we sat down with Tata Jose to begin hearing some if his teachings I looked over at a bottle of water that was swishing around and rocking from side to side. As we sat outside, a 6.6 magnitude earthquake rattled everything. An ominous beginning. Imlakesh - I salute the me in you. Our hosts showed deep respect and appreciation for Martha, as a teacher, dreamer. Our visit was part of the fulfillment of dreams I had had about the merging of the eagle and condor nations, the north and south, the black and white. I had first had these visions on a visit to the Ecuadorian Amazon rainforest a few years earlier while participating in a spiritual ceremony with a shaman in the Amazon. 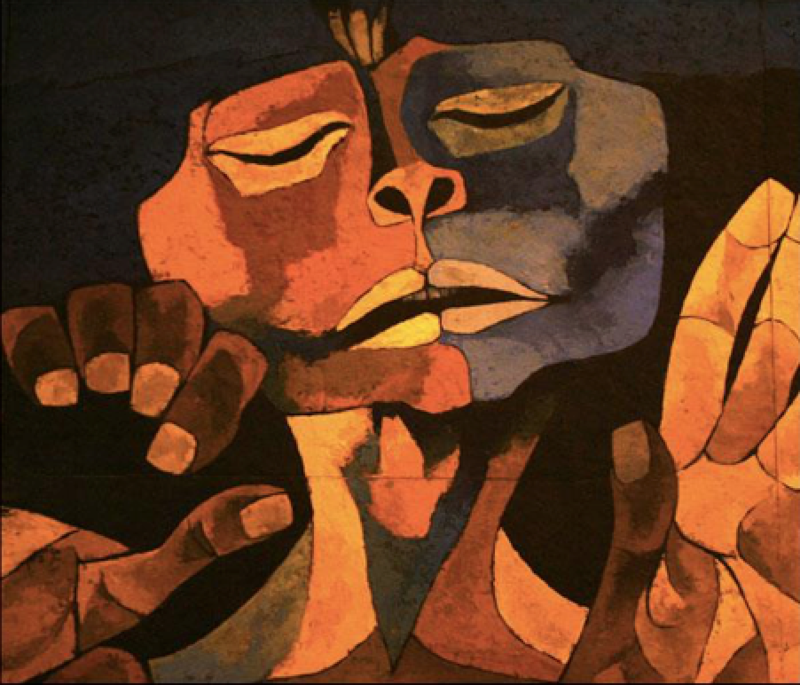 There a photo by the artist Oswaldo Guayasamin captured the essence of this vision. The two-sided image of a European and Mayan shows one hand clasping coal from a mine and another outstretched in a sign of peace. I had a similar vision of the merging of the black and white when I went on a daylong walkabout with African Shaman Mandaza while participating in a Fire and Ice ceremony in Greenland with shamans from all over the globe near Russell Glacier. As I washed my face in clear, cold glacial water as we began our walk I saw myself as a half black / half white journeyer. Over the years, this image has been recurring. took the bus to town with Victoria and kids to purchase home made hot tamales. As Christmas was arriving there were scenes of Christmas in a diorama set up in a corner of the room. Nana Vicky’s kids who were travelling with us and teaching me the mayan words for many of the items in the display. When I let forth a belly laugh “Ho ho ho” upon seeing a Santa Claus, children came squealing and running forth from the other room thinking the real Santa Claus had arrived! They stared at me curiously. Later in the week, we journeyed to the sound of music to gain a vision of how we were to celebrate the solstice. I shared my vision of spiral staff, snakes coming out of drums, and one fire starting and one going out: Two fires. When the visions were interpreted it was decided we were to do a sunrise ceremony on the solstice in a cave over lake Atatlan. We were to wake at 2 am to complete the three hour drive, hike in to the cave and set up for the sunrise ceremony on the shortest day of the year. As we set up the altar Venus sat glistening, prefacing the return of the sun. Prayers of Forgiveness, Gratitude were given before focusing on requests, then prayers for offspring, grandchildren. After a large breakfast we returned to our lodgings for a quick rest before going back to visit Tata Jose and his family to bid our farewell. We were in for a surprise. Upon arriving in the late afternoon we were handed water, drums, candles, baskets and all manner of materials which were being carried into the soon to close archeological site at IXIMCHE. Unknown to Martha and I, solstice would be completed when the sun rose on the following morning and our Mayan hosts were taking us into the archeological site for a private Mayan ceremony. It seems Mayans can flash their identity cards and gain unfettered access to such sites to perform ceremonies after-hours. If National Geographic had filmed this ceremony it would have been EPIC. The entire service was for the bat God K'an to fly down to the centre of the earth and back out again. It ran from 6 pm until after 6 am. The altar was dressed in greenery and candles. The night - the ENTIRE NIGHT was filled with songs, dance, sounds of drumming, flutes, rattles, poetry, rich costumes, ceremony, food - hot coffee and tamales and pigs ears were the preferred snacks through the mystical evening. We were active participants in the entire experience. All were invited to share what moves within them. There were so many elements that cannot be explained fully, other than to say people were transformed into bats and monkeys, snakes and other animals. The ecstatic dancers tumbled and rolled in otherworldly ways. We were taught that each solstice is a very important time to celebrate and hold ceremony, because each of these days is an opportunity to expand the vision for peace and unity in our world. “Don’t you want to be alive before you die?” We have to make room for taking chances and stepping out of our comfort zone in order to experience the extra-ordinary. This journey was an EPIC experience. It was EMPOWERING because we were treated as part of the community, not outsiders witnessing something, but active participants. We were invited to offer our insights, our expertise and our wisdom to help create our experience. It was a PEAK experience, something beyond everyday, something not available on a travel itinerary packaged by most tour companies. It offered new INSIGHTS into the importance of ceremony and taking time to let dreams flavour our decision making and it offered CONNECTION to people, places and experiences that is deeper than can be explained.